We have been ensuring community growers benefit from The Community Learning Exchange (CLE) - a peer learning project facilitated by the Scottish Community Alliance which presents a "fantastic opportunity for communities to learn through the exchange of ideas and the sharing of common solutions." The project is aimed at valuing the skills & knowledge the community growing movement has already cultivated, and encouraging groups across Scotland to visit others and learn from their experiences. Visiting groups gain inspiration and host organisations have the benefit of sharing their hard work with an interested audience. We have encouraged members in Scotland to apply to the Exchange Fund to visit any other project that they feel will benefit their learning. The visit doesn't have to be to another FCFCG member, or even to a community garden. If a group is interested in developing an alternative idea like running a cafe, energy project or wood workshop, then a visit to a project of this type can be arranged. Since The Community Learning Exchange was set up in 2015, 14 FCFCG members have successfully applied and been to visit other groups. Read on to find out more about how our members have benefitted. Forward Coupar Angus is a non profit Development Trust carrying out projects to improve the town of Coupar Angus in Perthshire. They have set up and run two community growing sites, and also have a small community shop which was in its second year of trading at the time of the visit. An ambitious group, they have plans to develop ‘field to plate’ systems within the town, integrated into the growing spaces and the shop. to understand the ways in which these projects had become established, the challenges they'd faced and their achievements along the way. Whitmuir Community Farm is a medium scale organic farm with a shop and strong community involvement. Pillars of Hercules has a large range of different growing settings: field scale polytunnels, chickens and orchards, as well as a café and shop. It also operates a packing shed to process food ready for the shop. Tours to both sites were led by the founders of the projects who were able to share their stories, explain the evolution that had taken place and what they have learnt (even the really hard stuff!). They gave personal depth to the stories of the farms and both had significant in depth knowledge around specific (sometimes challenging) questions asked by the visiting group. For Forward Coupar Angus the day was also a great team building exercise, giving everyone a day together learning and having fun, but also visioning and co-creating the next steps for what they want to achieve as a group. Since their visit, Forward Coupar Angus have moved forward with their plans, and in 2017 will be beginning a dispersed market garden. They aim to reclaim an additional 3 areas of "waste/unused" ground within the town on which to grow and develop market gardens for the community. 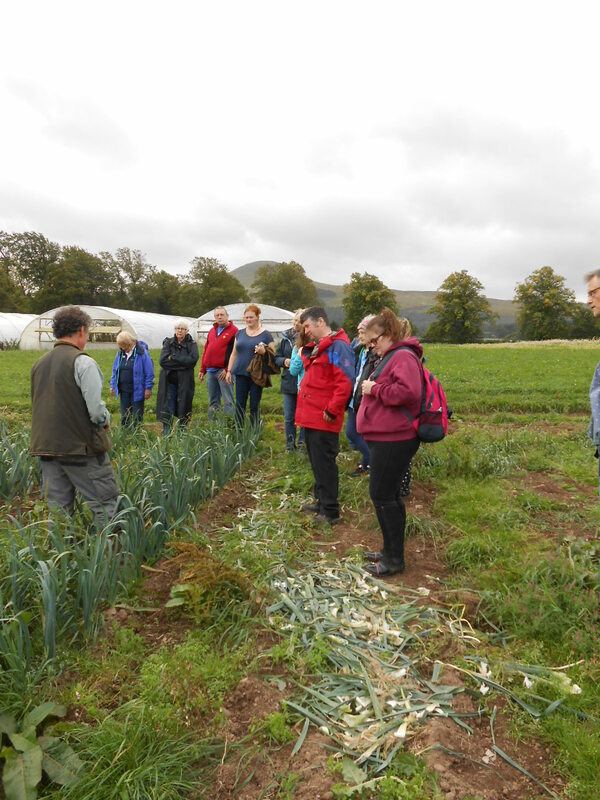 The visit to both Whitmuir and Pillars acted to both inspire them and increase their knowledge for their ambitions to grow more local organic food for Coupar Angus. The Hidden Gardens, Glasgow visited the Royal Botanic Gardens of Edinburgh to learn more about their distinctive plant collections and being a visitor destination which offers learning and creative opportunities. How Does the Exchange Fund Work? The CLE will fund up to 100% of the costs of a visit by members of one community to another community project up to a limit of £750. Up to £350 is available to pay the host project to allow them to be fully engaged with the visiting group. Groups can visit projects elsewhere within the UK where a similar project doesn't exist within Scotland. For more information about what can be funded, and how to apply, visit the Scottish Community Alliance website.